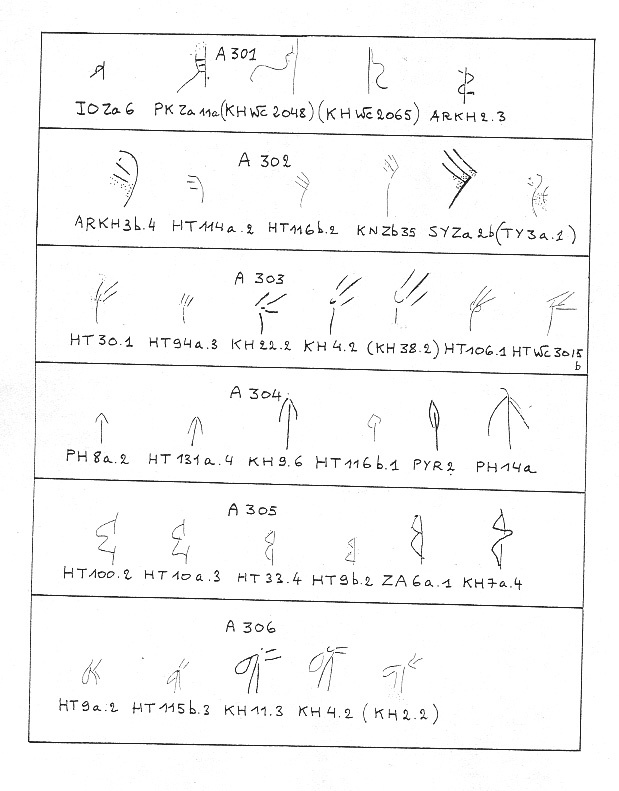 Our modern parent language for our Alphabet from the 12,000 year old Atlantean Azilian and Aterian tribes of Western Europe and Western Africa. I feel confident that this language also enabled the Egyptians to succeed in trade with the Mediterranean and European cultures or even Asia,India and Africa. At one time we all spoke the same language-----Atlantean, for from God's Island of Atlantis, we all came to be. The First Garden. Here are words from Religious or places and names in Linear A artifacts. The Gorilla symbol for 301 appears as a thread through a needle > NT? The Egyptian Neith is also related with weaving or needle work. Thus, A-TA-I-NT-WA-JA, or ATAINT.IW.JA is the same as Foremost Earthland of the island of JA. (iw = island in Egyptian). JA can simply be replaced by the Egyptian term for God as Ntr. (Neter). 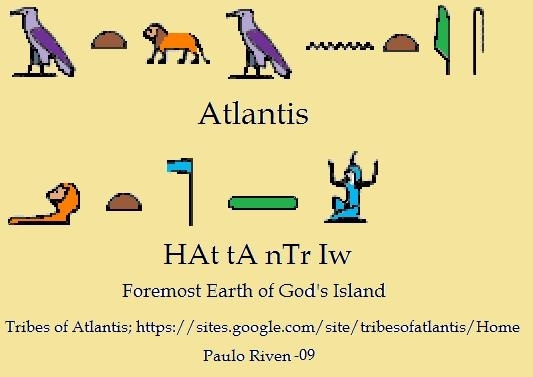 Compare my Egyptian Name for Atlantis as HAt.Ta.Ntr.Iw = Foremost Earthland of God's Island. Therefore as Atlas is Foremost (ruler) of the People, so is Atlantean as Foremost of the Earth People and Atlantis as Foremost Island of the Earth People. Deka - Leon = Greek for 10 Lions. Maia is Atlas' daughter. Apollo, the Sun or like Paulo, PA-ULO- Father to See or Look to Father or Father's Eyes. Atlas is first identified by Homer as having an island in the Atlantic where Calypso resided > Cleito. Tatai.nt, may refer to Tanais or Tanis in the Delta Nile before it became the hyksos city of Avaris, or TATA.IW.NT as in Earthland Island of Neith. It may also refer to Tatenen, the westward land and island of Neith as a possible name for Atlantis or somewhere west of Egypt to Neith's and Gebs lands. In either case, Neith also refers to JA MN, our true God and Father Creator as He would have been for Atlanteans, Africa, Asia, India, Egyptians and Europe. This name may be referring to Atalanteans or Atlanteans. Close to my English name for Atlantis as ATATANA, if you recall. 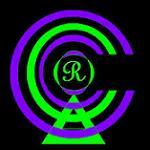 A-T-K..... A-TI-KA (cf. A-I-TI-KI) - place name, Attica , Greece. The above are my theories, and in honesty they may mean something entirely else. However, I feel reward shall justify the merit.